Here at EMA, we know that time is an engineer’s most valuable asset. Sadly, adding more time to the day isn’t an option, but we are constantly looking at ways we can help our users save time. 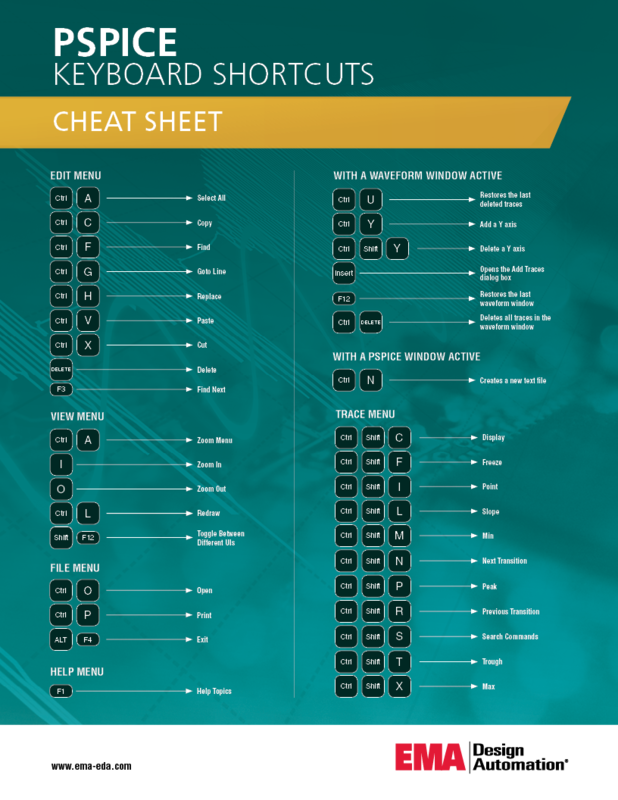 This is why we created the following keyboard shortcuts cheat sheet infographic for all our PSpice users. Keyboard shortcuts save time by taking out the need to search through options, especially for repetitive tasks. Did you know that an average person loses approximately 2 seconds per minute of work by switching back and forth from their mouse? That’s approximately 64 hours per year! We want to give you this time back. The infographic below is a list of the most common PSpice functions our users utilize on a daily basis. Feel free to print this and hang it at your desk or share it with another PSpice user you think could benefit from a little extra time added to their day.